Mississinawa Valley’s Cody Dirksen makes a catch over the middle of the field during the Blackhawks home game Friday against National Trail. The Blazers won the game, 41-14. 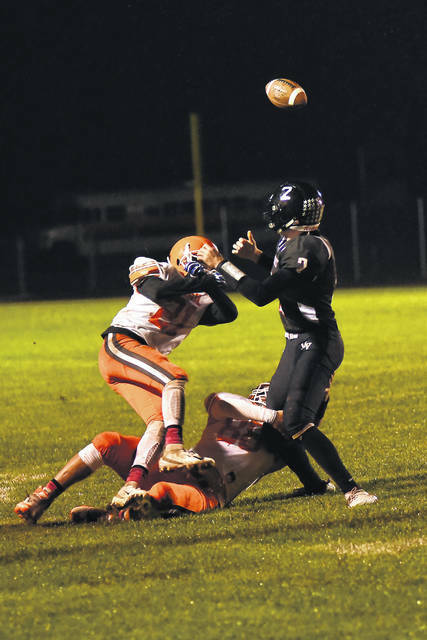 Mississinawa Valley’s Trent Collins has the ball stripped away by a pair of National Trail defenders during the Blackhawks home game Friday night. The Blazers won the game, 41-14. 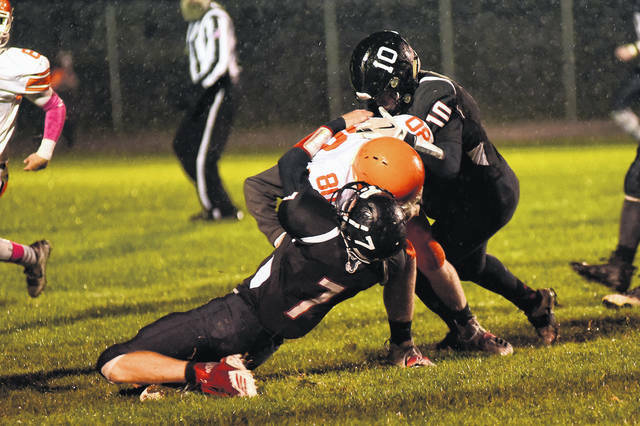 Mississinawa Valley’s Blake Scholl (7) and Cody Dirksen (10) combine for a tackle during the Blackhawks home game Friday against National Trail. The Blazers won the game, 41-14. Mississinawa Valley’s Elijah Livingston (65) chases a National Trail runner from behind during the Blackhawks home game Friday night. The Blazers won the game, 41-14. Mississinawa Valley’s Trent Collins (2) tries to get away from a National Trail defender during the Blackhawks home game Friday night. The Blazers won the game, 41-14. Mississinawa Valley’s Trey Godfrey gets taken down by a trio of National Trail defenders during the Blackhawks home game Friday night. The Blazers won the game, 41-14. Mississinawa Valley’s Will Hall gets a few blocks from teammates on this run during the Blackhawks home game Friday against National Trail. The Blazers won the game, 41-14. 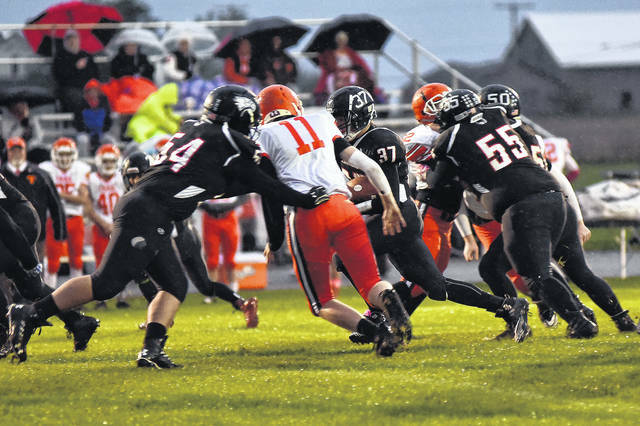 UNION CITY – It was a wet, windy and chilly evening for Friday night football as Mississinawa hosted National Trail in Cross County Conference play. The team who can hang onto the football in those conditions usually has a pretty good chance of winning. 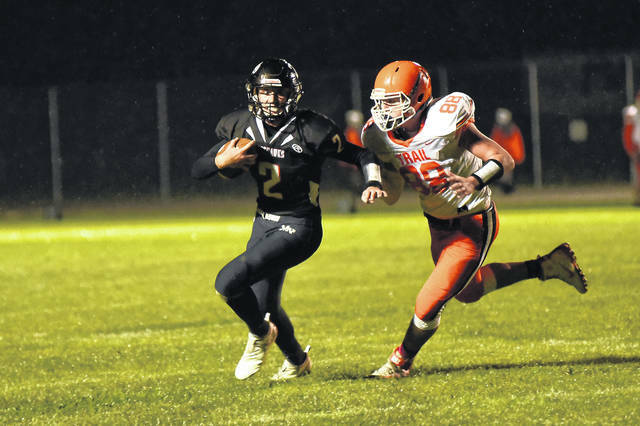 National Trail fumbled the opening kick-off and Mississinawa was quick to take advantage as they went 45 yards with Josh Fett sweeping around the right side from 7 yards out for the touchdown to give the ‘Hawks a quick 6-0 lead. Turnovers can be the gift that keeps on giving, but on this night the turnover battle was won by National Trail as the Blackhawks coughed up the football five times and threw two interceptions. Twice in the first half Mississinawa got inside the red zone looking to score only to cough the football up and National Trail responded by moving the football with a strong ground game and more importantly holding on to the football each time resulting in a score. Joe Lawson scored on a 20-yard run at 4:44 in the first quarter to help the Blazers take the lead 7-6, a lead they wouldn’t relinquish the rest of the way. In the second quarter, National Trail was facing a fourth and 1 at the goal line, but Evynn Short snuck it in on a quarterback sneak to go up 14-6 to lead at the break. Mississinawa put together a nice drive in the second half highlighted by a great catch over the middle by Cody Dirksen, who then added on a few extra hard-earned yards to put the ‘Hawks in good scoring position again. But another turnover put the ball back in the Blazers hands and they scored a back breaker on another quarterback keeper to go up 21-6 and took the wind out of the MV football team. National Trail scored two more times and led 34-6 with about a minute to go in the game when they struck a third time on a 40-yard pass to go up 41-6. 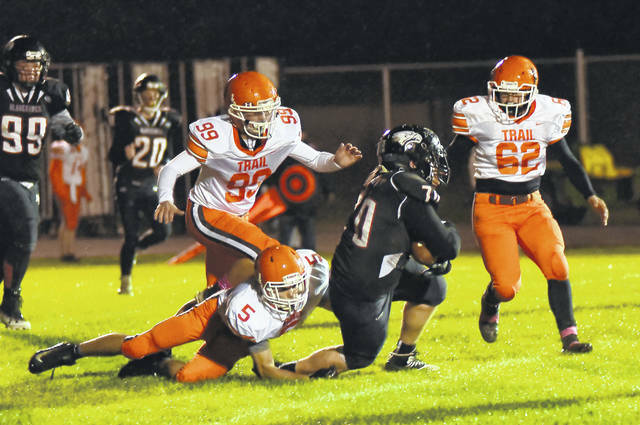 Josh Fett had just two rushes on the night and both went for touchdowns. This time he would cut back against the grain and outrun the blazers going 62 yards to pay dirt to make the final score 41-14. Afterward, Mississinawa Valley head coach Steven Trobridge was clearly disappointed in his team’s effort and the outcome of the game. 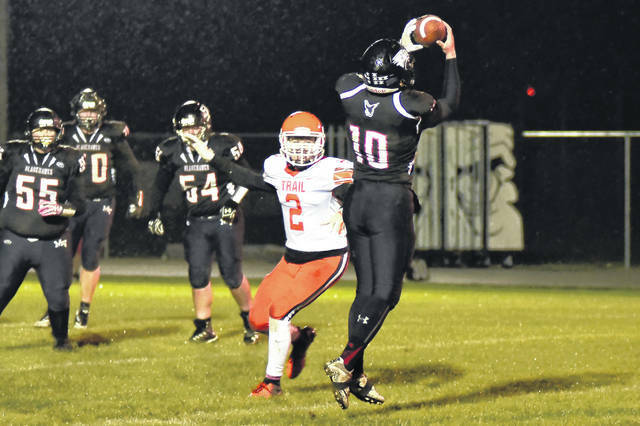 “I’m upset with how we went back to our old ways and ‘bail out’ mentality tonight,” Trobridge said. “We have to clean up our mistakes and stop hurting ourselves, the missed tackles and turnovers really did us in tonight,” Trobridge added. “I give credit and tip my hat to National Trail they played in the same environment as we did, and they were able to get the job done. 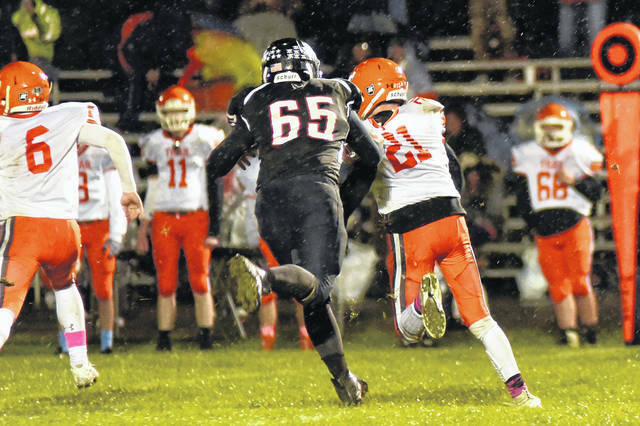 “We have to put this one behind us and get our focus back and get back on track as we get ready for Arcanum next week and our senior night,” Trobridge concluded. Mississinawa falls to 3-4 overall and 2-3 in the Cross County Conference. This entry was tagged CCC, Mississinawa Valley, National Trail. Bookmark the permalink.